Matt is a huge fan of crepes! He often talks about how he used to get Nutella and banana stuffed crepes in collage. 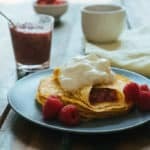 He decided it was time to recreate that memory with these Keto Crepes fill with an easy raspberry jam! Clearly, we think jams are great filling options from the recipe above. It's easy to whip up on the stove top and you can make it with all different kinds of berries to give your family all the options! Personally, I would go the whipped peanut butter route. All you have to do is whip up some heavy whipping cream until stiff peaks and then fold or mix in some chunky peanut butter. That would make the ultimate filling for me, while Matt would probably do the same except with almond butter. What About The Carbs In Crepes? Well, lucky for you these crepes are two-ingredients, making them nearly zero carbs. There are some trace carbs in eggs and a little in the cream cheese, but most of your carbs come from the jam filling. That being said, you can opt to make this almost zero carb if you use the crepes for a savory meal! You could fill these crepes with my personal favorite, egg salad, or go a heartier route and fill it with some leftover steak or chicken you have in the fridge for a quick on the go lunch wrap! Some other great super low carb recipes we love to make are protein cakes for dessert and macro muffins for breakfast! Keto Crepes Filled With Raspberry Jam! If you're not a fan of crepes, we have plenty of dessert recipes on our food blog you can check out, but we highly recommend you give these a try. They are super simple to make and you can fill them with you favorite fillings. At the very least, surely your kids will love filling and eating keto crepes for dessert! 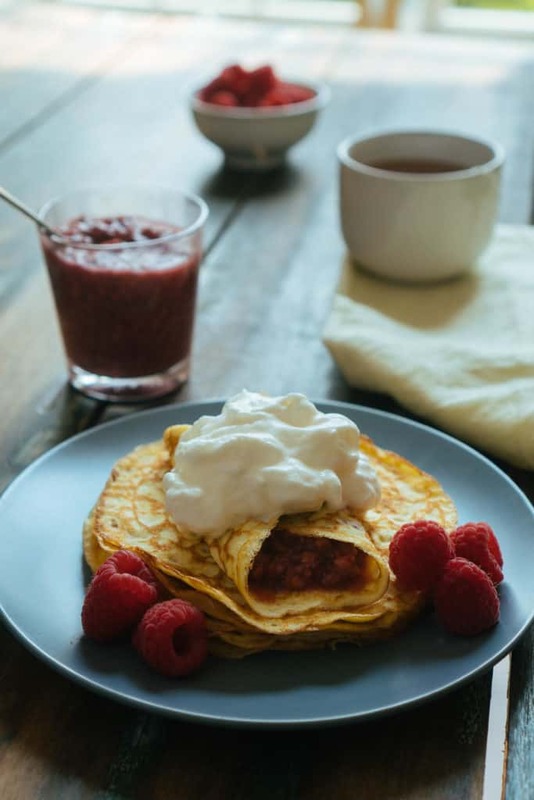 Recipe can be quickly added to MyFitnessPal - Search "KetoConnect - Keto Crepes"
Heat the raspberries and water over medium-high heat in a saucepan until raspberries have broken down, about 3-5 minutes. Once heated through, mash the berries using a spoon or spatula and remove from heat. Add in the stevia and chia seeds and combine using a spoon. Set aside and allow to thicken, 10-15 minutes. Best stored in an air tight container in the fridge up to 2 weeks. Combine all the cream ingredients in a large mixing bowl and mix with a hand mixer until uniform in consistency. Remove all the chunks as best as possible. Heat a small-medium non-stick skillet (we used 6 inch) over medium-low heat and grease with coconut oil spray. Once hot, add a little less than 1/4 cup of the crepes mixture to the pan and tilt to coat the entire bottom, until you achieve a thin crepe layer. Cover with a lid as it cooks though, about 60-90 seconds, until cooked and flip for another 10-15 seconds. Repeat with rest of crepe batter. It should make about 12 crepes. 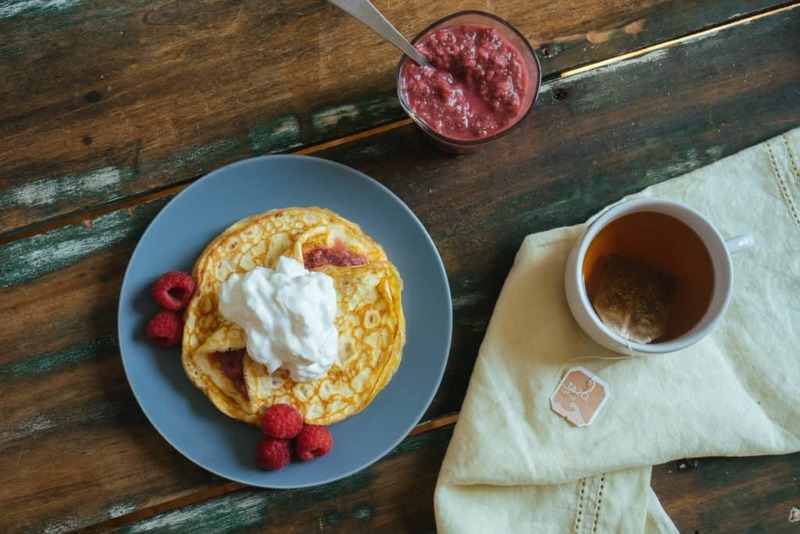 Serve: Place a crepe onto a plate and make a layer of jam and roll up. If desired, serve with some whipped heavy cream! Best stored in a zip top bag or sealed container up to 5 days. Enjoy!